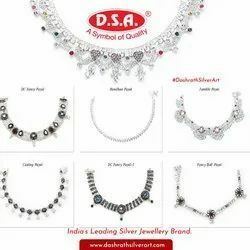 Prominent & Leading Manufacturer from Rajkot, we offer heavy silver anklets, heavy silver anklet, silver bridal payal and designer anklets. D.S.A.-A SYMBOL OF QUALITY. 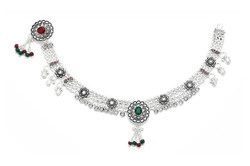 ROYAL TASTE OF SILVER JEWELRY. Its Shiny, its smooth, its solid...its Silver! Silver, a true reflector..silver jewelry manufacturer in Rajkot..Distributor in all over India, designer silver jewelry manufacturer. Silver Jewelry, Silver OrnamentsPayal .antique Payal , ball Payal , bridal Payal , pandal Payal , hallmark Payal , 92.5 Sterling silver Payal , Rajwadi Payal , Dullhen Payal , light weight Payal , heavy Payal , jhalar payal , gola Payal payajani all kind Payal and anklet supplier , manufacturer of India , distributer in Delhi, Punjab , Haryana , Gujarat , Up , Mp , Rajasthan , Orrisa , Bihar. Supported by skilled workers, we are indulged in offering a broad collection of Heavy Silver Anklets. 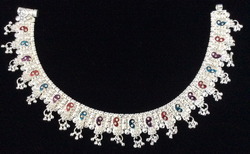 Supported by skilled workers, we are indulged in offering a broad collection of Heavy Silver Anklet. Matching up with the ever increasing requirements of the customers, our company is engaged in providing Silver Bridal Payal. Its Shiny, its smooth, its solid...its Silver. Silver, a true reflector..Silver Payal manufacturer in India.Silver Silver Payal Supplier In U.P. Silver Payal Distributor In U.P. Hallmarks Silver Payal, 92.5 Sterling Silver Anklets, Antique Silver Payal, Ball Silver Payal, Heavy Silver Payal, Light Weight Silver Payal, Casting Silver Payal, Fancy Silver Payal, Bridle Silver Payal, Broad Silver Payal, Pair Ful Silver Payal, Fitting Silver Payal, manufacture in rajasthan, M.P, Bihar, U.P, Delhi, Chattisgadh, Jaharkhand, Punjab.